There used to be a time when the word "superfood" wasn't a part of our collective consciousness. If you ordered an açaí and goji berry smoothie with a sprinkling of maca powder, people would stare at you speechless and mystified. ("Um… We don't have that.") Nowadays, kale and quinoa are as common as bread and butter—and we love it. Introducing nutrient-dense foods to our diet will only result in healthier selves. But you don't actually have to eat them; you can drink them, too. That's right, the buzziest way to get your superfood fix is to sprinkle powdered versions of these plants (like the aforementioned maca powder) into drinks like juices, smoothies, coffee, and tea. Take it from registered dietitian and nutritionist Lauren O'Connor. "These powders contain specific nutrients that are meant to help balance our bodies for optimal function and stamina, and can add to our overall nutritional needs." Keep reading to learn more about superfood powders, including the different kinds, what they do, and which ones are expert-recommended. Let's start with açaí berry powder. Açaí berries are one of the most familiar superfoods today. These purple Amazonian berries are purported to have a higher antioxidant content than their other fruity counterparts, including blueberries (which are basically supercharged with antioxidants). According to Dana James, CNS at Food Coach NYC, antioxidants lower oxidative stress in the body. This is important, since "the lower the level of oxidative stress, the slower the aging process." Açaí also contains healthy fat and fiber. There hasn't been much distinctive research on the health effects of powdered açaí, but many people swear by it for improving digestion, skin quality, energy, and mental clarity, among other things. As for superfood powders in general, use them in conjunction with a healthy diet, not on their own. "They are best when used within a balanced whole food–based diet and can provide some of the essential nutrients we can't always fit in our daily diet alone," says O'Connor. Dana James agrees, saying, "They won't erase the sins of a bad diet." Chlorella's dark green color is due to its crazy amount of chlorophyll. "It contains double the amount of chlorophyll, the green pigment in plants, which can boost energy levels," says James. It's used mainly for detoxification of the body, but specifically the digestive tract, as many people take it to cure and prevent a number of digestive ailments. No matter if it's chlorella, açaí, or a different superfood, do your research and check the ingredients. "First and foremost, it is important to choose a powder that is low in added sugars (if not absent from them) and as minimally processed as possible—that means it doesn't contain a laundry list of ingredients including fillers, harsh chemicals, additives. Ingredients contained should be beneficial to the body and easy on the digestive system," says O'Connor. "In my opinion, keeping the ingredient list short and simple (with mainly whole food ingredients) is the easiest way to know the product is clean." Spirulina is a derivative of algae (aka seaweed). Before that turns you away, know that it packs some serious nutrition. "It contains protein and amino acids, including GLA, which is an essential fatty acid. It also has a high concentration of iron," says O'Connor. "As we know, proteins are the building blocks of life and are needed to support our daily wear and tear (of our muscles) and support our bodies from the cellular level on up to our physical qualities (e.g., skin and hair). Fatty acids support our heart and brain health (as well as provide shine and suppleness for healthy skin and hair), and can help improve our mood. Iron is necessary for maintaining adequate oxygen in the blood—deficient levels can lead to fatigue," she continues. Healthy skin, shiny hair, protein, and energy? Yes, please. It's clear to see why so many people swear by this superfood powder for being the perfect mix of a health and beauty supplement. "It is alkalizing to the body and helps clear pesticides, mercury and other toxins," says James. "My personal favorite is spirulina powder added to a smoothie with blueberries, cacao, almond milk and my beautiFUEL Protein Powder ($55)." Maca is a plant native to Peru. Although there isn't as much research backing it compared to other superfoods like spirulina, it "contains protein and essential fatty acids," according to O'Connor. "It is known for enhancing energy, stamina, memory and physical performance, and it's suggested to improve menopausal symptoms. Whether or not these claims are fully substantiated, the having enough protein and essential fatty acids in the daily diet is important for our health and well-being," she says. James says that along with energy, "maca can help support the body's ability to adapt to stress. It can also improve hormonal balance." Its link to testosterone is what boosts energy (and might even "activate sexual arousal"). 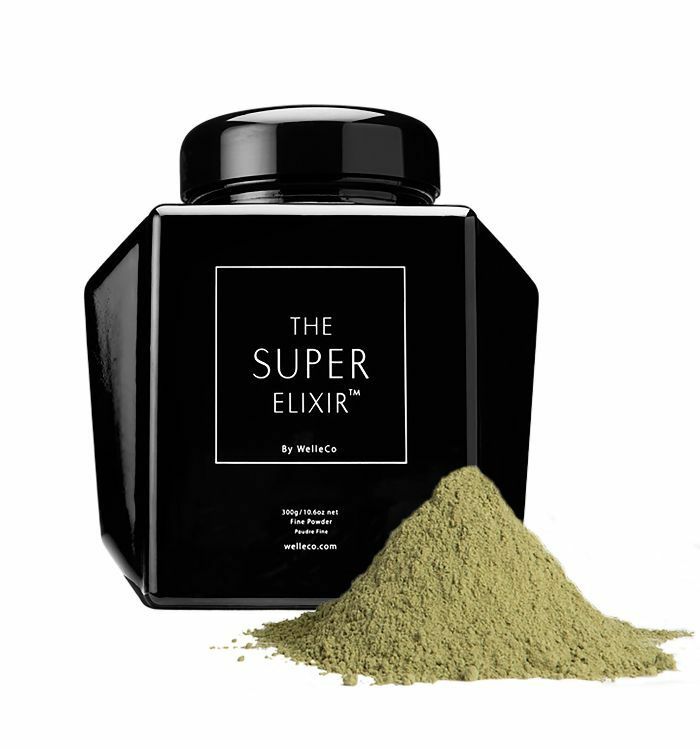 This superfood powder is derived from Moringa leaves, a plant native to places like India and Pakistan. You might recognize the name since it's found in different cosmetic products for the purpose of increasing skin health (after all, this study shows it's beneficial in skin anti-aging and revitalization). "The most potent form is from the leaves," says James. "There has been some research on its blood sugar lowering properties, and it is believed to increase mental agility and cognition. It can also help protect the liver from free-radical damage." Baobab powder comes from—yes, you guessed it—the baobab tree. Like Moringa, it's been used for ages in traditional medicines in its native Africa, thanks to high concentrations of vitamin C and vitamin B. It also contains a bevy of minerals like calcium, potassium, and magnesium. According to James, it serves as a prebiotic for the good bacteria in the gut, which can help decrease bloating and support higher energy levels. More energy? We'll take it. To be clear, there are superfood powder blends that may contain a combination of those listed above. Those are great, too, as long as you make sure they're actually clean. "If I have to decipher a long list or have no idea what an ingredient is, then it’s not worth buying," says O'Connor. She usually sticks to protein powder or a blended greens formula. "To get an ideal amount of protein in my day, while on a mostly plant-based diet, I rely on a quality protein powder first thing before my morning workout," she tells us. "In fact, I add it to my nut milk for my homemade coffee 'latte.' When I need a little boost in the late afternoon, a greens powder mixed in a smoothie or with some water can certainly help prevent me from over-snacking and get me through to my next meal. I can also get in vitamins and nutrients such as vitamin C, vitamin D, potassium, calcium, and magnesium to name a few." Try PaleoPro Paleo Protein Powder ($40), which "is made with grass-fed lean beef protein and egg protein," or PaleoPro Paleo Recovery Powder ($30), which has sweet potato and egg white protein. "It tastes great simply mixed with water, too!" As for a green powder, she likes Garden of Life's Perfect Food RAW Organic Green Super Food ($27). It's a combination of "farmed green juice blend, antioxidant blend, organic sprout blend, and a probiotic/enzyme blend." It contains wheat grass, barley, beetroot, flax, and spinach, among other things. As for James, "I love Sun Potion!" she says. "Everyone should take a B complex, since we use the Bs to create energy, regulate hormones, metabolize alcohol, and detoxify." A Byrdie favorite is Sun Potion's Mucuna Pruriens Powder ($37). Next up, read about 12 superfood-infused products that will give you glowing skin!